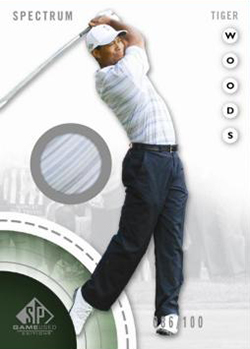 2014 SP Game Used Golf hits the links with a high-end configuration that includes an autograph and memorabilia card in every pack. Signed rookies, jumbo memorabilia and the return of popular Inked Drivers are among the highlights. Every three-pack box has a First Tee Rookie Autograph featuring early autographs from the likes of Rory McIlroy and more. The second autograph in the box is either an Ink Drivers card or a Leaderboard Letter Marks card. 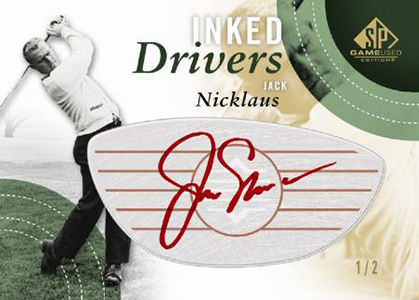 Inked Drivers debuted in 2012 SP Game Used Golf and use a faux driver plate as the signing surface. Parallels include Persimmon (#/10 or less) and Red Steel (#/5 or less). Leaderboard Letter Marks have a manufactured letter patch on them. The signature comes on an acetate-like surface. For those who want to take on a challenge, they can work towards spelling the golfer's name. Tour Gear memorabilia cards feature a variety of different low-numbered combinations of shirts, caps, gloves, buttons, tags and patches. 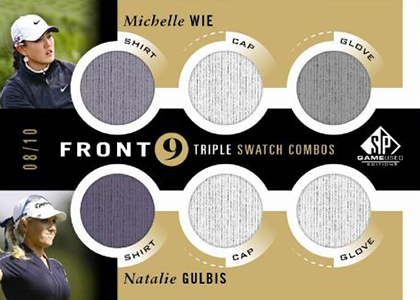 Front 9 Combo cards (#/10) have a total of six swatches split between two golfers. Supreme Gear (#/3) delivers over-sized memorabilia pieces. Base cards include both autographed and memorabilia parallels. 40 cards. Click here for short print info. 40 cards. Each player has different cards for each letter of the last name. Print run listed is the total amount for all cards combined. 30 cards. Click here for short print info. 20 cards. Click here for short print info. 10 cards. Click here for short print info. Looks intriguing, curious to see who will make the checklist lineup. 2014 SP Game Used Factory Sealed Golf Hobby Box Jack Nicklaus AUTO ?? ?